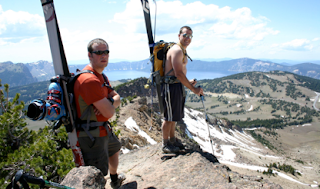 of Oceanography at OSU and also splitting up with his fiance, so Chris Holm and I decided it needed to be a guys weekend with Hartz doing something exciting in the outdoors... with skis of course. much shorter than we thought it was. After a few beers and looking up at a very thin sheet of snow going from the base to about halfway up the mountain we decided, what the hell, lets ski it. As we were packing our skis onto our packs we got a lot of funny looks from all the people passing by us with sneakers and mountain bikes asking us where the hell we planned to ski. A van of frat-boy-looking guys laughed at us when we asked them to take a picture of the three of us. while taking pictures, drinking a beer and relaxing. I tried to ski up as far as I could to “high-mark” it, jumping over a small rock in the process. Chris followed and Hartz did the same. We then cruised down the remaining snow to the base of the mountain. It turned out to be some really fun skiing, although short-lived. the road towards Diamond Lake where Hartz showed us a great camping site, although we got attacked by mosquitos all night despite the fire we built. We decided the next morning to skip Thielsen and just head back to Corvallis which was good because it poured rain all day and I certainly wasn’t going to free climb the 5.6 route at the top in a lightning storm. It was really great to spend another weekend in the mountains with the three amigos. Pictures below show our route.